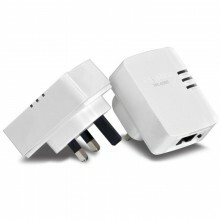 This twin pack of HomePlug network extenders puts a network point anywhere in the house where there is a mains socket. Each unit can both send and receive. Initially two of these units are needed. They are both identical. Plug one into a mains socket near the router. Connect a network lead from the router to the Homeplug. Plug a second unit into a mains socket in the room where you need the network point. Then a network lead to the computer or satellite receiver. The data is transferred through the mains wiring. No problems with wireless interference of wireless security problems. The Powerline 500 AV Nano Adapter Kit, model TPL-406E2K, uses any electrical outlet to create a secure high-speed network. Connect the first adapter to your network and plug the second adapter into any outlet on your electrical system for instant high-speed network access. The compact form factor saves space around crowded electrical outlets. This adapter automatically connects to other TRENDnet Powerline AV adapters with no installation required - TRENDnet recommends pressing the 'Sync' button to automatically change default encryption keys. Use up to eight adapters to network devices in different rooms without running new cabling. The power save mode reduces power consumption by up to 80%, and quality of service (QoS) technology prioritises video, audio, and online gaming. LED displays convey device status for easy troubleshooting. Advanced 128-bit AES encryption secures your network. This adapter is ideal for use in buildings that interfere with wireless networking signals. Click the button below to add the TRENDnet 500 Mbps Compact Powerline Adaptor Homeplug Twin Pack to your wish list.